Hell is so horrific because it’s a fallen place, and that’s what fallen places are like: miserable and painful. This article will discuss how by pure logic the conclusion is reached that reality can only contain a place like the Biblical Hell for the souls of those who have rejected God and not been chosen by God, and that this place can only be as it is described in the Bible: a place of maximum torment and misery. I will spell-out the deductive logical argument for this below. 41 Then shall he say to them on the left hand, Depart from me ye cursed, into everlasting fire, which is prepared for the devil and his angels. 41 “Then he will say to those on his left, ‘Get away from me, you who are accursed, into the eternal fire that has been prepared for the Devil and his angels! 41 Then the king shall say also to them, that shall be on his left half, Depart from me, ye cursed, into everlasting fire, that is made ready to the devil and his angels [which is made ready to the devil and his angels]. 41 At that He will turn to those on His left hand. King: Get away from Me, you despised people whom My Father has cursed. Claim your inheritance—the pits of flaming hell where the devil and his minions suffer. 41 “Then the King will say to those on His left side, ‘Go away from Me! You are guilty! Go into the fire that lasts forever. It has been made ready for the devil and his angels. The argument below reveals that the existence of Hell is a spontaneous outcome of human free-willed sin distorting God’s Creation. Water temperature lowering, by the laws of nature/reality, automatically, lawfully, and spontaneously leads to and causes water changing to ice. The scars of sin, altering and contaminating Creation, by the laws of reality, automatically, lawfully, and spontaneously led to (caused) Creation having an altered structure and form. The existence of Hell is a natural product of the sin-distortion process. With sin entering the world via the Fall, Creation was changed, from pure to fallen, from unscarred to scarred, and thus Creation’s properties and entities were distorted accordingly. Due to the fall, and due to the fact that there will be humans who reject God in the fallen reality, the argument below shows that there has to be a place to “house” souls that reject God with finality, who reject God to the point of no turning back, choosing to be maximally separated from Him forever (that is, they reject Christ up to the point of their physical body death). Since sin in the physical world distorted Creation, likewise Hell can only be a sin-distorted, sin-scarred, place since the hopelessly fallen sinners will live there. Just like the way the world is fallen (painful, hateful, violent, sin-scarred, etc.) due to its being contaminated with the scars of sin, so too must Hell be, since it is the place that the unchosen rejecters of God must end-up, but in the case of Hell, it is fallen to a maximum degree (Hell would have more fallenness, more separateness, from Trinity than our physical world does). Just like the world has separation from God and thus is a place of misery and pain, so too with Hell, but to a significantly greater degree. That’s why Hell can only be how it is described in the Bible: it’s a spontaneous product of the disease of sin distorting Creation, involving the maximum separation from God, and thus the maximum fallen-misery. With those points in mind, the following logical argument shows the ironclad logic that verifies the existence of Hell, not as being caused by God, but rather by human sin—it simply follows automatically from the apple event (sin scarring the world). There are no Bible verses that show that God created Hell. Only one in Matthew that shows that Hell was “prepared,” by whom we don’t know, and our only reference to it in the Bible is that it was prepared (which is not identical to being created). Adam ate the apple, and Creation was altered by sin, analogously like a virus or disease spreading out from the apple-event, and into all of Creation. More specifically, Creation was distorted, for the simple reason that it no longer was the same entity: at one moment (pre-apple) it was not contaminated by sin, and the next moment (apple willfully being eaten) it was contaminated or scarred by sin. At the pre-apple moment Creation had the qualities of being uncontaminated by sin, then at the apple-eaten moment it had the qualities of being contaminated—so it can’t be the same entity, the same Creation, from one moment to the next: from one moment to the other Creation had different qualities, different attributes and therefore altered beings and entities, as the scars of sin spread and deformed possibly nearly everything. From one moment to the next it had no thorns on bushes to having bushes that will produce thorns. From one moment to the next, the lion went from laying with the lamb to eventually wanting to savagely devour the lamb. So, an amazing deformation of all of Creation occurred from one moment to the next, where the two worlds (Creation uncontaminated and then Creation contaminated) became, in many ways, opposite of each other, pre-apple to eaten-apple. So, Creation became a place contaminated by sin, and such a place naturally involves the sort of existence for humans that goes with sin: confusion, shame, hate, violence, lies, and all the rest–which are really types of torment. Creation became a place of misery and torment, since that’s the sort of place a sin-contaminated place is. The post-apple world contains the unchosen/non-elect, who will remain in sin (do not become children of Christ) up to the point of their death. The contaminated Creation will require there to be a place to “house” those unrighteous referred to in point 5, a storage area (Hell) for those who hate and reject God after they die (bodily death). The storage zone of the unrighteous souls referred to in 6 has to be maximally distant from God, a larger separation from God, since these beings have not been saved by God, changed into His likeness, and therefore are not worthy of being in God’s presence (since beings of sin, not like God, not with Godliness, cannot have His presence). For the same reasons that Creation was concluded to be a place of pain and torment in step 4 above, in the same way, the aforementioned storage house for the unrighteous for eternity has to contain maximal separation from God and therefore maximum ramifications of that sort of a separation from God: maximum torment and pain, misery and horror. But Hell is precisely that sort of place: a place of sinners, for sinners, who have chosen maximum separation from God, and, ipso facto, it is a place of greatest misery and torment (a maximum level of misery and torment, since it involves the maximum separation from God). Human free will (Adam eating the apple) is responsible for Hell, and Hell spontaneously formed in the same way that thorns spontaneously formed on bushes, and the appetite of the lion to eat the lamb spontaneously formed in its body and mind: because of human free-will, not because of God. This makes a lot of sense, since God cannot create sin (and hence why Calvinist-Augustinian theologians call sin “nothingness”). 11. CONCLUSION: And for these reasons, Hell must exist merely if sin exists and if the non-elect exist, and Hell can only be just like what is described as in the Bible: a place of misery and torment, since, like the world (which is also a place of misery and torment that we are to hate, John 12:25), Hell is a place of sin and misery. I am not saying every moment of life on Earth is pain and torment, but only that a lot of it is, unlike how our lives in the Glory of God will be on the New Earth in the future. But verses like John 12:25 and Luke 14:26, as well as the life of Jesus, show us that we should not be expecting life on Earth to be free of a lot of pain. 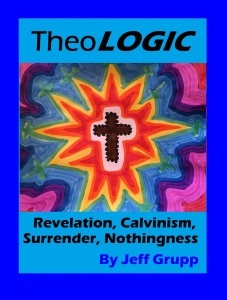 Grupp, Jeffrey, 2018, “God’s Pre-Election Knowledge of the Soul: A New Interpretation of Biblical Election and Predestination Showing Why God Only Chose Some Rather Than All,” in Theologic: Revelation, Calvinism, Surrender, Nothingness, Kalamazoo: Praise and Love Church, (print copy available at Lulu.com, free online copy at Praiseandlove.net), pages 5-33. Here is a video covering this article, see YouTube link immediately below (the article and PDF are slightly updated over the video). Here is a second video about issues related to what is in this article, see YouTube link immediately below. Title of this one is: God did not Create Hell, Human Sin Did, and it Can Only Be a Place of Torment.